Being a Stylist as well as a Home Stager, I am always on the lookout for new ways of incorporating my love of natural products into my home and work at EHG Home & EHG Prop. Natural materials add texture and contrast to your home interiors. As wonderful backdrop to your home, the natural beauty of these pieces will stand the test of time and can be softened with soft furnishings such as rugs, throws and cushions. We adore a Scandi vibe at EHG Home as you all know; this tends to involve chunkier wooden elements and rougher textures. However... 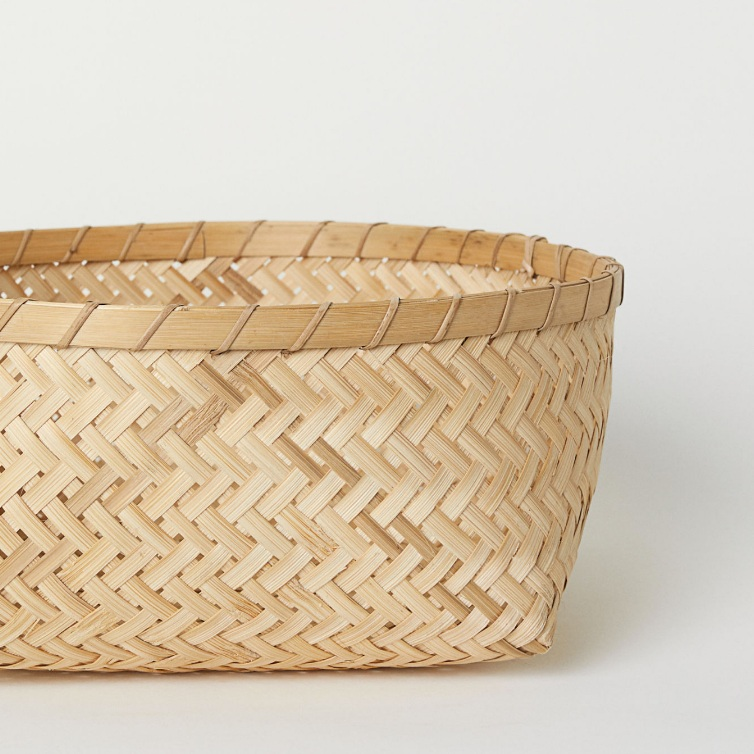 If you’re after a more subtle natural addition, try rattan weave, and bamboo!! When it comes to rattan, people tend to think of garden furniture. Here at EHG, I see it as a much more versatile texture to work with. Rattan is wonderful for creating a relaxed vibe and textural interest in YOUR home. 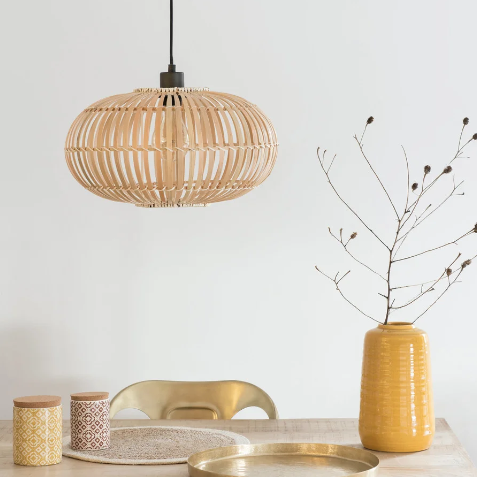 the classic style of rattan pieces such as armchairs, lampshades and home accessories will sit beautifully WITH most decor styles AND FOR added textural interest, layer your rattan dining and armchairs with sheepskins and throws. Rattan furniture is set to have a big revival in 2019 – THE EHG STYLISTS saw it time and time again in Paris at Maison D’ Objet. 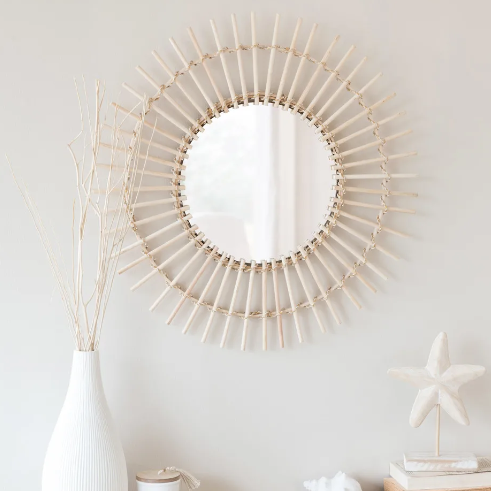 The rattan wood style (yes rattan is an actual plant) was one of the top ‘pinned’ interior trends of 2018 – and has an incredible ability to represent both a summery feeling and a nostalgic, comforting aesthetic. A perfect example of how to make rattan work outside of the garden, is this chic and stunning couch from Abigail Ahern - WHICH I LOVE! Soft, natural looking BUT contemporary. There are so many ways to use rattan... it may surprise you have versatile it is! A revival of the artisan art of weaving is bringing a feel good calming factor to contemporary interiors. I particularly like this trend and WORKED together with woven and patterned fabrics CREATES a stylish, relaxed and natural look. Materials and textures range from raw and rustic to smooth and refined, most are influenced by the beauty of the natural world and give an AUTHENTIC look to your interior. We stock FOR HIRE a variety of woven items, from accessories and chairs, to bedsides and cabinets. Cork, wicker and woven plant fibres such as seagrass will be everywhere from kitchens, chairs and room dividers to planters and lighting... just you wait! This beautiful freestanding Bamboo Display Cabinet will show off your crockery, ornaments, and treasured display pieces in style. the Bamboo Display Cabinet is a vintage/antique style cabinet with glass doors so that you can create quirky displays that will catch your eye as soon as you walk into the room! An ideal kitchen cabinet, fill the Bamboo Display Cabinet with all of your crockery, mugs, and serving platters or alternatively, in the living room or home office filled with books, stationery, quirky ornaments, green plants, and treasured items! A multi-functional storage solution, you could even create a cabinet of curiosities with this gorgeous Bamboo Display Cabinet. No longer confined to A conservatory, bamboo and rattan furniture is back and a totally acceptable addition to the living or dining room. Try ‘au naturale’ or go for a glossy lacquered finish. It slips perfectly into a monochrome Scandi-cool scheme or with the seventies back in a big way. The love for traditional craftsmanship and handmade design will continue to be a huge interior trend in 2019. Values like sustainability, craftsmanship and the natural FORM will be some of the buzzwords IN 2019 AS we want to symbolise that we care about nature, by buying ecologically and choosing natural materials when decorating our home. In addition, there also is an increasing trend in modern society, that we want to live a MORE natural and simpleR life AS SURROUNDED BY SO MUCH TECH.